Weekly Outlook: Dow Jones Industrial Average heading (July 9th -13th) ? Inspite of all uncertainties and fear from Euro zone debt crisis, US stock market has managed to survive on the hope of easing from Fed, ECB and other central bankers of the world. Bulls are hoping to get more short squeeze as maximum investor are still playing defensive. 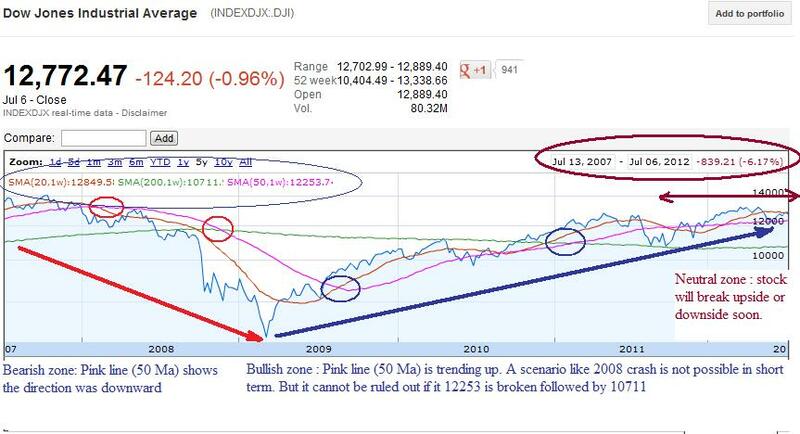 Bears are still hoping for crash like 2008. Lets analyse where dow is heading next and whether any crash is on the horizon. 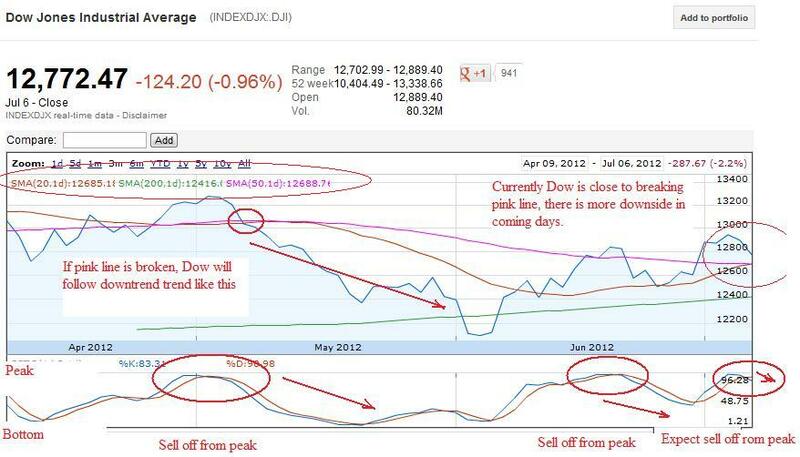 In the chart, Red circle and arrow is bearish sign. Blue circle and arrow is bullish sign. Click on the chart to enlarge it. Dow opened in the bearish zone, but it closed in the bullish zone. 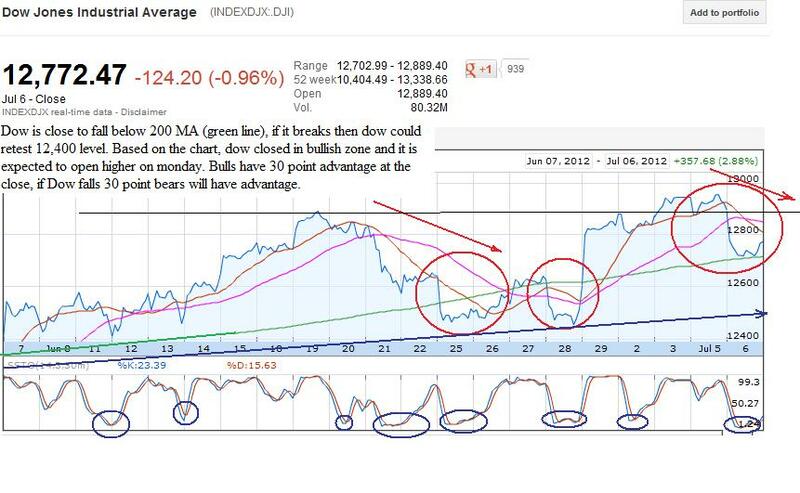 It is expected to open higher on July 9th, unless Dow futures opens 30 point lower. Rest of the day continuous sell off is expected as the trend is bearish. For bullish sentiment to continue Dow needs to break 12,805. 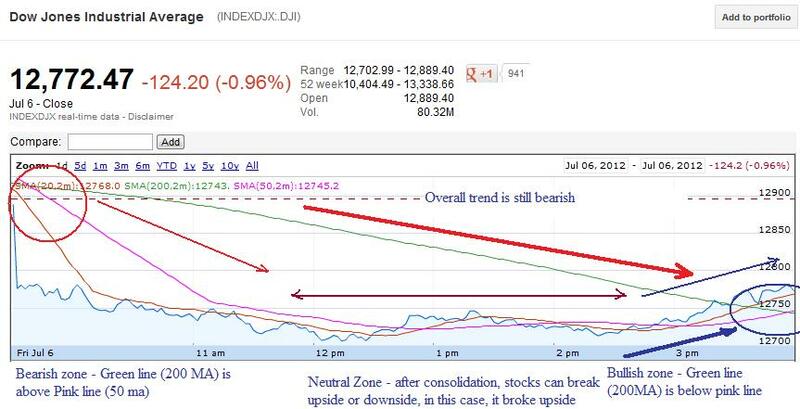 For bearish sentiment to continue, Dow needs to break 12705. 12705 is also key resistance for downside. Dow most important resistance is 12705, if it breaks another 200-300 sell off is expected. One month chart is still bullish, but 12705 is the level to watch next week on the downside, while 12805 is for upside. Dow 3 month chart is showing more sell off in coming days. Is 2008 financial crisis like scenario possible ? Its not possible atleast next week. If you look at the 5 year chart, its in consolidation zone, it has to break upside or downside soon. The trend is getting little bearish. Dow has major support at 12,253 followed by 10751. As volatility is near 52 week low and earning season will kick off with AA reporting after hours on Monday, followed JPM and WFC on Friday, there will be big swing in the market.